First time buyers in London pay double to get on the housing ladder than anywhere else in the UK, despite prices in the capital falling, new research has found. The research also reveals that the average deposit paid by a first time buyer in London is £92,833, some 62% higher than in 2013 and house prices in London’s outer boroughs have increased by 47% in the last five years for all buyers. During the past five years, the average price of a property bought by a first time buyer in London has risen by 64%, from £255,794 to £420,132. The typical deposit used to buy a first London home has also increased greatly and is more than double that which other first time buyers across the UK choose to put down as a deposit at £92,833 compared to £39,668. Since 2013, the number of buyers getting on the housing ladder in London has fallen by 5% to 42,983 in 2017. Five years ago 17% of all first time buyers in the UK were in London, but today that proportion has fallen to 12%. The number of London first time buyers has fallen for three consecutive years whilst the overall number has increased for six years straight across the rest of the UK. Elevated house price levels are likely to have been a key factor in this slowdown of first time buyer activity, the report points out. Camden is the borough where first time buyers need the highest average deposit, having increased from £137,079 in 2013 to £175,844 in 2018, a jump of 28% while Haringey has seen the biggest increase in deposits paid by first time buyers, which have more than doubled from £63,447 in 2013 to £131,827. As a result of high property prices, the size of the average London first time buyer mortgage has risen by 65% in the last five years to £327,299, compared to £170,847 for the rest of the UK. However, it is still cheaper to buy than rent, the research points out. A typical three bedroom house would cost a London first time buyer around £1,248 per month with the rent for a similar property coming in at £1,545, a difference of £3,568 per year. The price of a home in London has increased for all buyers, to an average of £600,000 currently, the research also shows. It means that the average house price in London has increased by 40% from £435,712 in 2013 to £610,701 in 2018, compared to a growth of 20% for England and Wales. London’s once cheaper periphery locations are now key growth areas. House prices in outer London boroughs, such as Barking and Dagenham, Haringey and Waltham Forest, for example, have grown by 47% in the last five years from £348,230 to £511,184. In inner London boroughs such as Camden, Greenwich and Lambeth there has been a surge of 44% in prices from £447,781 to £645,791 in the same time period, while prices have increased in the City of London, Westminster and Kensington and Chelsea by 37%, from £1.22 million to £1.68 million. This far outstrips the growth seen across the rest of England and Wales of £238,333 to £286,822. However, whilst prices are lower in outer London the gap is closing. In 2013, the average house price of £348,230 for a home in outer London was 20% less compared to London as a whole at £435,712, while today the gap is 16%. ‘Despite the recent slowdown in London house prices this latest data shows how expensive it has become to live in the capital, particularly for young people trying to get on the ladder for the first time. As a result, first time buyers have to wait until they are 34 before getting their first foot on the property ladder,’ said Andrew Mason, Lloyds Bank mortgage products director. ‘While property prices drop as you head to the fringes of the capital, our analysis is showing that this gap is closing as house price growth in Outer London boroughs is continuing to increase at a greater pace than Inner London boroughs. This healthy growth may be linked to a high demand for these more affordable properties as well as some areas benefiting from the new Crossrail link due to open next year as commuters move further afield,’ he added. The report suggests that as high prices continue to rise, social housing will play an ever more important role for those who can’t afford to buy their own home. 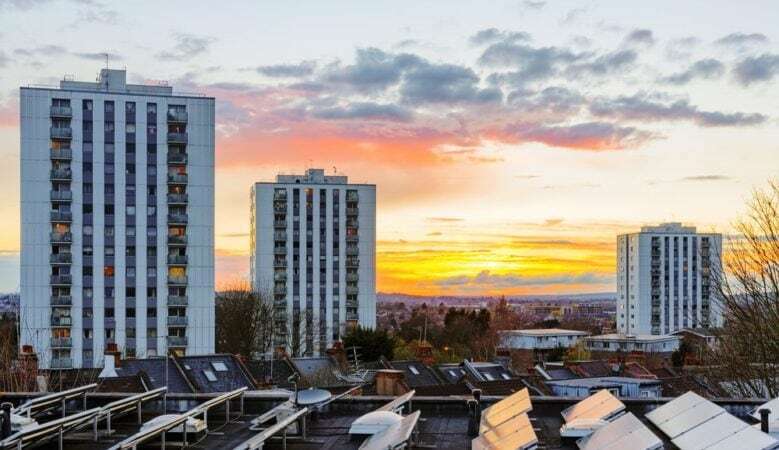 Social housing provision is higher in London compared to the rest of England, with almost one in four homes, or 23%, of the housing stock accounted for by social housing compared with 18% in England. Within London there is large variation between local authorities in the provision of social housing. In Redbridge, Harrow and Kingston upon Thames they account for 10% of total housing stock, rising to 42% in Islington, Southwark and Hackney.